YANGON — One of Myanmar’s largest private banks, KBZ, announced that it would finance the entire restoration of the Secretariat, one of the most prominent historic and colonial architecturally significant buildings in Yangon. A statement from the bank released on Thursday said the restoration was expected to be completed by the end of the year. It added that the restoration would reimagine the entire venue and create new public and commercial spaces for modern Myanmar citizens to gather, learn about their heritage and reimagine their futures. The bank didn’t disclose the amount of the loan. U Aung Kyaw Myo, the deputy CEO at KBZ Bank, said the restoration would revitalize not just the immediate area, but also all of Yangon. “Our shared views on the potential for the Secretariat to contribute to economic and national development were reaffirming. In addition, the developers demonstrated a strong commitment to environmental standards that are in line with our own values and criteria,” he said. 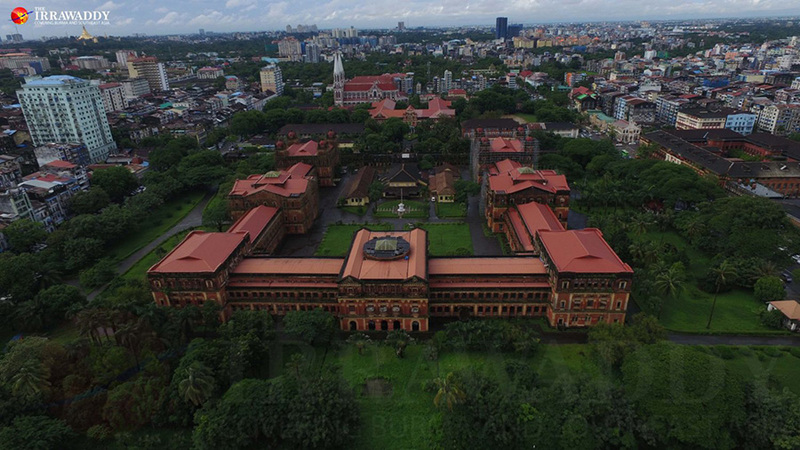 Built in 1890, few colonial structures in present-day Burma are as historically important as the magisterial Victorian-era complex located at No. 300 Thein Phyu Road. It served as the headquarters for the British-Burma administration during colonial times. In 1947, Burma’s independence hero Gen. Aung San, father of State Counselor Daw Aung San Suu Kyi, and his colleagues were assassinated in an upstairs room in the west wing of the complex. Standing in the center of the Secretariat courtyard is a flagstaff where the flag of a newly independent Burma was first raised on Jan. 4, 1948. After the 1962 military coup, the complex became the Minister’s Office. It was used in this capacity until 2005, when it was abandoned as the military regime suddenly made Naypyitaw its administrative capital. Currently, renovation at the complex is now underway with a Conservation Management Plan commission by the Yangon Heritage Trust, by the Secretariat conservation group run by Myanmar Cultural Heritage Co Ltd, which is collaborating with Anaw Mar Group. The Anaw Mar Group won rights from the Myanmar Investment Commission in 2012 to restore the building’s architecture and preserve it as a historical museum and arts and cultural center. The group is owned by family members of former junta general Tun Kyi. Dr. Maung Maung Thein, director of the Myanmar Cultural Heritage Co. Ltd., said in a statement that it was an honor to be working with KBZ on the restoration project. “Upon completion, this is a destination that all Myanmar citizens will be proud of and will refer to for generations to come,” he said.